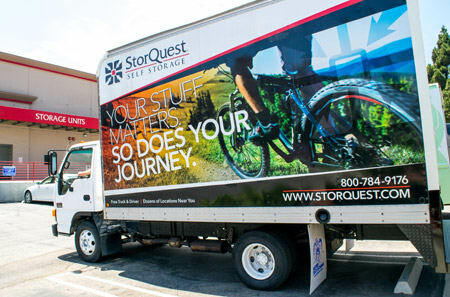 At StorQuest Self Storage's state-of-the-art storage facility, located off the I-25 freeway, on E. Evans Ave, between S. Dahlia St and S. Holly St, just south of the Cherry Creek Shopping Center, you'll experience self storage like never before. With a multitude of facility features, our newly constructed self storage units stand head and shoulders above other Denver self storage facilities. At StorQuest Self Storage, not only do you get quality self storage, but peace of mind comes standard with each unit. 24-hour digital security monitoring paired with a fenced and well-lit facility instills confidence and minimizes worry. Access to our self storage facility in Denver is granted with a unique passcode entered at our electronic gate. Our friendly and professional staff are prepared to answer any of your questions. Access your belongings seven days a week at our Denver self storage facility. You'll appreciate covered loading and unloading areas; especially when it's raining or snowing. We Sell Boxes & Locks too! What sets StorQuest Self Storage apart from other Denver area self storage facilities? In addition to 24-hour security monitoring and knowledgeable staff, we also provide a level of convenience that is unmatched in our area. Thanks to our wide driveways, you can simply maneuver and navigate moving trucks filled with your belongings. Once you get here, dollies and carts are available for your convenience, and ground-level units make moving in a lot easier. Do you own an area business? StorQuest Self Storage in Denver happily accepts deliveries on your behalf. Move inventory, equipment, and tools directly to your storage unit and you can access them 7 days a week. That's just another one of the ways we make self storage in Denver even more convenient. Contact us for more information about our state-of-the-art self storage facility in Denver, CO.